Every Design For A Difference project is an open door for a community to join forces, give back, and showcase their talents in an exciting way. 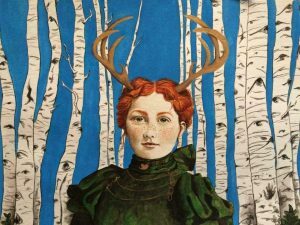 And it doesn’t get any more real than in America’s Heartland, where we met up with our featured tenured artist, Holly Meyers, of Hiraeth Art in Madison, Wisconsin. Holly’s Fall 2018 project is her 2nd collaboration with Design For A Difference Madison. Working in conjunction with IDG Showroom, FlOOR360 and their award-winning design team, Holly and fellow artist Christy Grace partnered to benefit the East Madison Community Center (EMCC). EMCC was in need of an uplifting, healing mood, and as the recipient of this year’s outreach, found the perfect cure in Holly’s trademark healing style. By their caring and creative gift, two dull walls of the library were brought to life. Larger than life, actually; where a mural transformed the space and indeed the mood by featuring a whimsical scene of children reading books, expanding their horizons by creativity. So who exactly is Holly? 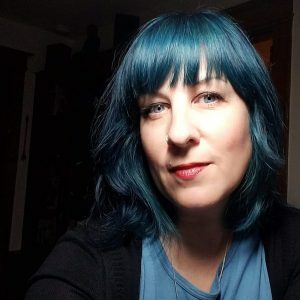 Holly has been a member of the Madison community for some 7 years, and more recently has followed her childhood fascination with art and boldly made her debut on the artist scene. 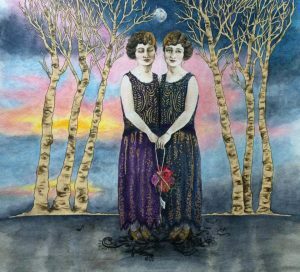 Holly’s featured medium has been watercolor, where she expresses relatable yet anonymous historical women and children, and their untold stories to which each of us react in a variety of deeply meaningful personal ways. Her work has made an impact within her community and has gained formal recognition in Stories Told and Untold at Gallery C in Iowa in 2016, and from many within the fine art industry. Join us for an intimate interview with Holly as she reveals her personal journey into her work, how it is connecting her to other women, and how moving to Madison as a single mom looking for her own makeover launched the career of her dreams. HG: Tell us about your background and how you first discovered your love of art. HM: My father was in the military, which led to my overseas birth and early years in Ruislip, England. I was the only girl in the family and grew up with 3 brothers. He left the military early in my childhood and we moved around a lot after his discharge. As a child I was drawn to fashion magazines and I drew a lot of ponies. Lots of ponies. I would also copy dresses and redesign them as my own. I loved the clothing and patterns and glamorous lifestyles I saw in those magazines. HG: How did having 3 brothers impact your childhood? HM: Honestly, I think it gave me a longing to find a sisterhood in my adult life and really look at what it means to be a girl and woman. We had very different views in the world. In our childhood it was easy as our time together was spent riding bikes, catching frogs, and just being kids. But as we grew up, I found that being the only girl raised by a mother who was being a mother and unavailable, I became somewhat isolated, which also led to me to art. HG: What led you to pursue art as an adult? HM: I saw a lot of instability in my childhood, financially and emotionally. It resulted in my getting married and having children at a young age and years of experiencing life’s struggles as a single mom. When we moved to Madison, I was looking to find a fresh start after leaving an unhealthy relationship and found myself at my lowest point in life. I had lost everything, and was trying to make sense of the whys and hows and figuring out what to do. It was actually at the prompting of my therapist that led me to take up art again. One day she just said, “I would love to see what you’d do if you created art for yourself.” And that was all it took. HG: Tell us about your first piece and how it led to your position as an artist. HM: My first piece came along pretty fluidly. I knew I always loved art so it seemed like an easy go-to in healing, journaling, and making peace with that experience. For me love was my downfall and that became an easy subject. My first piece came to fruition as I was shopping in an antique mall and stumbled upon old cabinet cards (vintage portraits from the 1900’s). The majority of the photos were of women and that really stood out to me. I remember wondering if they had the same struggles. Had they been alone? Had they started over and found themselves in a mess they too had to recover from? It was then I found a beauty in the artistry of the clothing and felt a comfort within the women in these photographs, and how many stories we all have from our lives to tell. Were theirs the same? Did we share and suffer the same afflictions and hardships and did it turn out how we hoped in the end? I worked on that piece as I journaled, and those photos built my current foundation as an artist. HG: Why women and children? HM: Being a woman with children was what I connected with and knew. Those life purposes and journeys. The world of women and motherhood are the things that affect my life directly. HG: Tell us more about what attracted you to historical women, the anonymous and untold stories. And does all your work feature historical subject matter? HM: Not all my work is historical but a lot of it focuses on the connection to past lives of other women and their stories untold. Maybe I could find a common connection in this life to the past. I do some modern style art but my heart is truly with that honoring of those stories of those women and with other women. Empowering us in hopefully finding new life in an old discarded photo. HG: You mentioned that your work is connecting you to other women. Is there a favorite story you’d like to share? HM: There are many, but I want to respect their privacy. However I do feel comfortable sharing a story from the show I had at Gallery C in Dubuque, Iowa. A woman had bought a painting of two women who were holding a heart with a bright sunset behind them. The piece was about finding peace with your inner battles. As the woman shared her story and why she wanted it, another woman came up to ponder it with a similar story, and started crying. It was really beautiful as we could all relate in our pain and healing through that same painting. That was a defining moment for me, that my story and art could heal another and bring a sense of peace and comfort… that we were not alone. HG: How has becoming an artist changed you? HM: It has changed me in ways I didn’t even know could be possible. It has given me a voice to be free. To heal. To use my art to raise money for things I believe in. To really do what I had always dreamed of. It has connected me to my community more and allowed me the ability to travel around to other places. My art was all the things I needed. HG: Did you ever imagine that you’d follow this childhood passion? HM: I did not, but I do believe that because of the way my life unfolded it took me around to rediscover art again. HG: Describe who you are as an artist. HM: As an artist, wow this is a hard one… I guess I would like to think of myself as a story teller, bringing new life to my art that allows me to make connections to the past and present. I’ve had the pleasure of using my art and skills to do good in the world when I can. HG: Do you have a favorite piece? HM: My favorite piece is called Down in the Aspens. 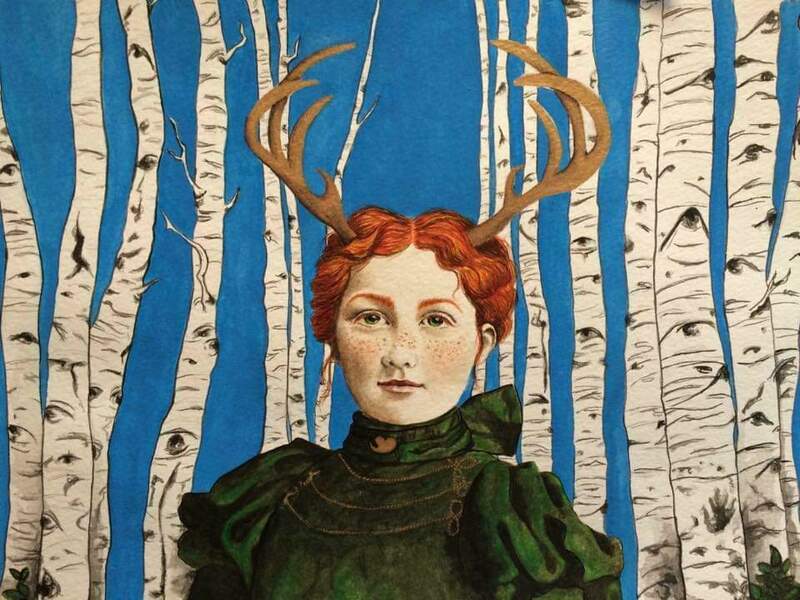 It portrays a woman in green with gold antlers and she is standing with Aspen trees behind her. This is a strong and defining piece for me in finally feeling grounded in my life. HG: Let’s talk about your work with DFAD. How has your involvement with the movement impacted you? HM: Being a part of the makeovers and a collective part of my community means a great deal to me. These resource centers are valuable and people deserve to feel welcome and honored no matter what their situation. After being in so many different places in my life, especially now as an adult and mother, I understand the value and impact of these centers. Seeing the community members who use these resources thrive and smile knowing we truly care is so amazing. Additionally, knowing the dedicated staff and volunteers have a beautiful new space to offer to people is a great gift as well. HG: Do you have a special moment you’d like to share? HM: Yes! One moment defined the whole experience. While I was waiting to meet some of the designers and see the space I was outside with the kids and asked one of them if they knew where the library was. She took my hand and led me into EMCC, we passed a food pantry in the front walkway and she stopped, looked at me and said, ‘here’s some food if you need anything, just take whatever you need.’ That was something I will never forget. She is a great example of the kindness and openness that these community centers instill. We need more of that. HG: You mentioned taking a break and regrouping… what do you think is next? If you could do anything with your work, what would it be? HM: I think for a while I needed to reconnect with my community and myself. I’m now back in a place where I’ve begun a new collection and I would love to find opportunities with galleries to show and share my current work. I have also envisioned putting together a book of my writing and art. I would like to keep using my art to do good as often as possible and continue building my career as an artist. HG: Will you continue to be involved in future DFAD projects? HM: Absolutely, to be invited to this project was an honor. This group is such an amazing gift to local communities. They allowed me to be apart of reimagining a space that advocates for others and do what I love while making a difference. It truly doesn’t get better than that. HG: Thank you, Holly. Your story is beautiful, inspiring, and your art leaves us feeling grateful to have such amazing talent join our design team in Madison. We wish you all the best in the years to come.